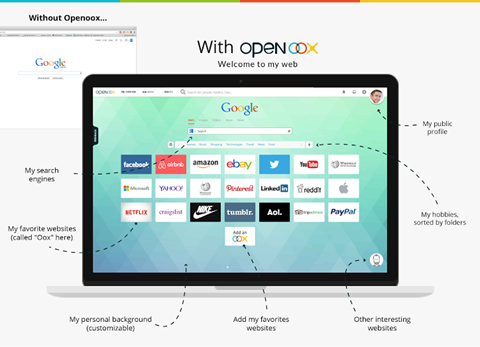 I was recently invited to try out Openoox which is a brand new concept that creates a homepage which collates your bookmarks, social media and files. It relies on a cloud-style security system so that in the event of a hard drive crash or just the fact that you're accessing a different computer (or on your tablet or smartphone), all your favourite links are safe. Openoox is free and takes literally a few minutes to set up as a basic homepage however, the more you use it, the more find you can do with it. Registration is completed using your email address, Facebook, Twitter or Google+ and requests basic information such as personal details, your preferred search engine and your favourite websites to help you create your homepage in five easy steps. New items can be added to the homepage easily by adding more bookmarks (you can import your existing browser bookmarks if you wish), personal files and links. Openoox is a French company and I was the 5424th person to join. You can "follow" other Openoox users (Ooxers - here's my profile) and share your links or create public files. At the time of review, my social sharing announcements were in French (or didn't translate properly) and the homepage examples linked direct to the French version of the nominated website (e.g. Amazon France) but this is easily changed. Updating my public profile was very easy and self-explanatory. I'm currenly using Openoox as my own homepage and moving things around to find a layout and set up that works for me. Give it a try and let me know how you get on with it.